Mercer Island resident Steven Schickler jogs down a crosswalk between SE 40th ST and Island Crest Way Thursday Morning. Drew Stuart/staff photo. 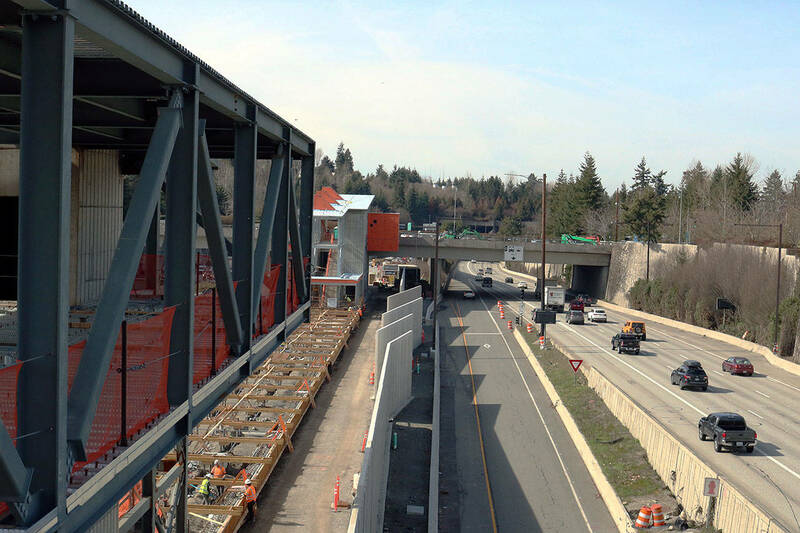 Mercer Island recently completed two important bicycle and pedestrian safety projects. The city of Mercer Island recently recognized the completion of two bicycle and pedestrian safety projects. Completed in early December, several improvements were made to the Mercer Island Park-and-Ride at 8000 North Mercer Way. Ross Freeman, sustainability manager at the city, said the city worked with Sound Transit on consultation of the design, and Sound Transit itself worked on the construction and design implementation. When the facility was built, Freeman said, the Mountains to Sound trail was routed through the property. Sound Transit installed new safety features along the front of the curb where the trail runs next to North Mercer Way. Obstacles were removed, westbound bus shelters changed locations, clear pavement markings were made and sight lines in the area were generally improved. The improvements were designed to separate the different types of uses the area gets in order to improve safety, and make sure buses, pedestrians and cyclists all move safely within the system. On Dec. 6, a celebration ceremony was held to acknowledge the completion of safety improvements along Southeast 40th Street, by Northwood Elementary School. Freeman said the project was a large undertaking and just one of two important “missing links” in the city’s north-south trail route. The Southeast 40th Street project improved safety along the corridor by adding new curbs, sidewalks, bike lanes in places they did not previously exist. The improvements covered several blocks, including the intersection of Southeast 40th Street and Island Crest Way. With a large project that involved widening the road, some utility lines, power and transmission poles were moved as well. Because the road ran by the school, it was important to make safety for everyone using the route the highest priority, Freeman said. Construction began in June 2018, and was completed at the end of October. Freeman said a Washington State Transportation Improvement Board grant of $500,000 helped fund the approximately $1 million project. The second “missing link” city road project is planned to begin in 2019. Freeman said the city has the funding to do a study in 2019 to examine what improvements are necessary for a section of road where Island Crest Way runs along Island Crest Park. He said the road does not have a good bike shoulder due to width constraints. The improvement of that section would allow the continuous north-south bike route on Mercer Island to be easily accessible for cyclists.